The other day, I got a call from Ken Beck, a friend and journalist who writes a lot of articles about local history. He asked if I have ever heard of a former Cumberland University student named Wendell Mayes. When I said that I did not know the name, Ken began to explain. While doing research on something else, he came across Wendell Mayes and learned that he was a Hollywood screenwriter who worked on screenplays for such movies as The Spirit of St. Louis, Anatomy of a Murder, North to Alaska, The Poseidon Adventure and Death Wish. Ken wanted to write a story about Mayes but discovered that he had no children to interview. He found a great article about Mayes. However, one great article does not turn into another great article. In short, I was sent on a mission to find out about his time at our university. After spending time not finding much at the Alumni House, I asked one of our librarians. Here is a hint. If you need to find information then see a librarian. They know all of the tricks. One of their best tricks is finding someone who can find the answer. Within a few hours, Joshua, one of my former students, sent an email with information. 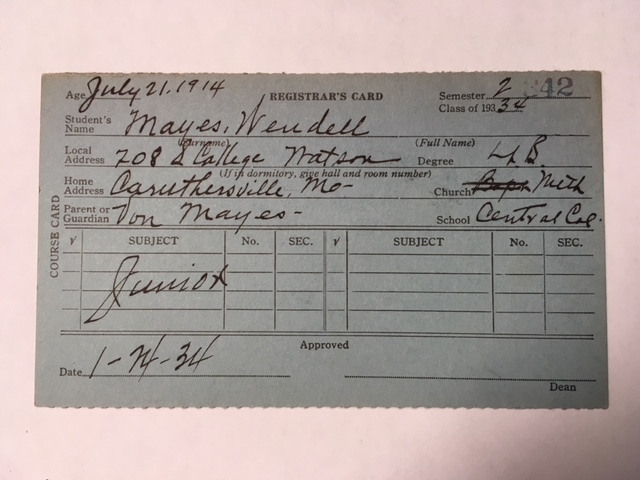 Wendell Mayes was born in Caruthersville, Missouri in 1914. This is important because most sources list him as being born five years later. He attended law school at Cumberland University in the 1933-1934 academic year. Joshua even found a copy of his student registration card. Internet Movie Database list Mayes’ first writing credit in 1951. If anyone knows what happened in those 17 years please let me know. In the meantime, I will honor Wendell Mayes’ legacy by listing some words of wisdom that came from his movies. Nothing too wrong with this dead reckoning navigation… except maybe the name. If you open your eyes and look, you’ll see things for what they are. Where the wind blows too hard, the trees gotta bend. People aren’t just good or just bad. People are many things. I never met a gin drinker yet that you could trust. A sure way to empty a hotel fast: drop an elevator.